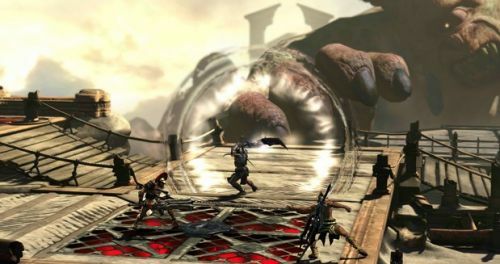 The latest entry to the God of War series, God of War: Ascension, has been out for almost a month now; providing players with plenty of opportunity to play against each other in its competitive multiplayer modes, or cooperatively in the "Trial of the Gods" mode. As with other games that have some combination of competitive and cooperative modes, your avatar's levels and progression carries over in both modes. So if you sharpen your blades in the competitive world and then decide co-op is more your pace, you don't have to start all over. The development team has been keeping an eye on the online portion and the community responses to see how everything is working out. Based on that feedback, they're releasing a patch soon (1.04) that will address "some key issues our community has helped us to identify and diagnose." The main goodies in this patch are an increase in the god allegiance levels from 30 to 40, new items and upgrades for each allegiance, and better matchmaking. More info about these can be found below. One of the biggest enhancements in our upcoming 1.04 update will be increasing the allegiance level cap from 30 to 40. With the addition of 10 levels for every God allegiance, we are introducing a new item, two new relics, and an ultimate magic for every allegiance. For our Champions who have ascended to the highest levels, and for those on their way, now you have a new goal to reach. It will not be an easy journey. We want you to show off! You will now be able to access your accomplishments in battles from the main menu. In addition to displaying your prowess in competitive combat, from death/kill ratios to win percentages, we want to see how you are faring in Trial of the Gods. We are very aware of the audio drop issues many have been experiencing. This was a critical fix for this update, as a powerful and immersive audio mix is a tremendous part of the God of War experience. We apologize again for those impacted — now you’ll be able to better enjoy our sound team’s painstaking efforts. Our work in addressing this and getting players into matches as quick as possible is non-stop. We have already made numerous improvements based on your feedback at our boards and social channels, and have recently bolstered our ranks internally to make further improvements. You should be seeing marked improvements daily; please continue leaving any feedback in our forums. We are addressing the shard issue preventing players from attaining the Spear of Destiny and Barbarian Hammer in version 1.04 (possibly sooner), and have made additional tuning changes, namely on weapon shard drops for some of the rarer weapons, as well as unlock requirements for certain armor pieces, weapon stats, and magics. While none of these are specific improvements to the "Trial of the Gods" mode, the benefit to an integrated multiplayer experience like this is that everything gets the benefits from these patches. No word yet on when the patch will be released and Vincent also teases some news on DLC. Hopefully that new content will be as friendly as the patch. Page created in 1.3867 seconds.